The Atlanta Hawks will pretty much look the same this season as they did last year and that’s sort of a good news/bad news situation. Atlanta was able to keep Joe Johnson, but the Hawks had to hand him a ridiculous contract to do so: six years, $124 million. Many experts ridiculed this as the worst contract in the league. Is Johnson a good player? No doubt, as he averaged 21.3 points per game last year and has averaged at least 20 points, four rebounds and four assists in each of his past five seasons. But is Johnson really a $20 million-plus a year player (more than LeBron)? It wouldn’t seem so, especially after he went in the toilet in Atlanta’s embarrassing second-round playoff sweep at the hands of the Orlando Magic. Johnson averaged just 11.8 points per game and shot 29.5 percent from the field in that series. But the Hawks really didn’t have much of a choice because teams like the Knicks, Bulls, Heat and Mavericks were after Johnson. Still, most people would tell you Johnson isn’t even the best player on the Hawks – Josh Smith is. Another contract issue could be a problem with this team in 2010-11. Jamal Crawford, acquired by Atlanta in a trade with Golden State last summer, will make $10.1 million in the final year of his contract. He wants an extension beyond 2010-11 after winning the NBA’s Sixth Man Award and helping the Hawks to 53 victories and the No. 3 playoff seed in the East. If Crawford doesn’t get his deal he might demand a trade. The team doesn’t seem likely to give him a deal because he plays the same position as Johnson and the Hawks drafted potential replacement Jordan Crawford (no relation). Locking in All-Star center Al Horford to an extension is now the club's top priority. Horford has improved his points, minutes and shooting percentages each year since entering the league. Despite improving Atlanta’s record for the fifth year in a row, Coach Mike Woodson was shown the door after Orlando won that playoff series by an average margin of 25 points per game. The Hawks replaced Woodson by hiring assistant Larry Drew on the cheap. Drew has implemented a motion offense designed to make the Hawks less predictable on that end of the floor. Maybe that will help Mike Bibby, who regressed big time last year after getting a three-year extension. Bibby had the worst season of his career, averaging 9.1 points and 3.9 assists per game, and he isn’t a very good defensive player at all. He could lose his job sooner rather than later to Jeff Teague. 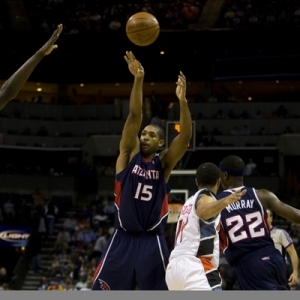 The 2010-11 Atlanta Hawks schedule opens on Oct. 27 at Memphis. Other than drafting Jordan Crawford the only other moves of note were signing veteran big men Etan Thomas and Josh Powell. Neither will start but both will help spell Horford at times. The Hawks still are one of the smallest teams in the league in the frontcourt. The Hawks also traded Josh Childress to Phoenix for a 2012 second-round pick. Atlanta also received a $3.6 million trade exception. Atlanta is +3000 to win the NBA title, +2000 to win the Eastern Conference, +1000 to reach the East Finals. All odds are courtesy of BetUS. You want a trend? Here’s pretty much all you need to know about the Hawks: Since reaching the conference finals in their first year in Atlanta, the Hawks have made the second round of the playoffs 14 different times and lost all 14 of them, including sweeps the past two seasons. And that’s really probably the ceiling for this team: the second round of the playoffs. Atlanta was rather fortunate just to get there last year, barely squeaking by a Bucks team in the first round that was without an injured Andrew Bogut. With teams like the Bulls and Heat getting better and the Bucks getting Bogut back, Atlanta won’t finish with the third-best conference record again. I’d project about 48 wins, third in the Southeast Division, a sixth playoff seed and a first-round playoff exit.